The Naval Training Unit Records were transferred to the University Archives in the early 1960s. The Naval Training Unit Records are organized into four series: V-5 Naval Flight Preparatory School, V-7 Naval Academic Refresher Unit, V-12 Naval Training Unit, and Miscellaneous. Each series is arranged alphabetically. 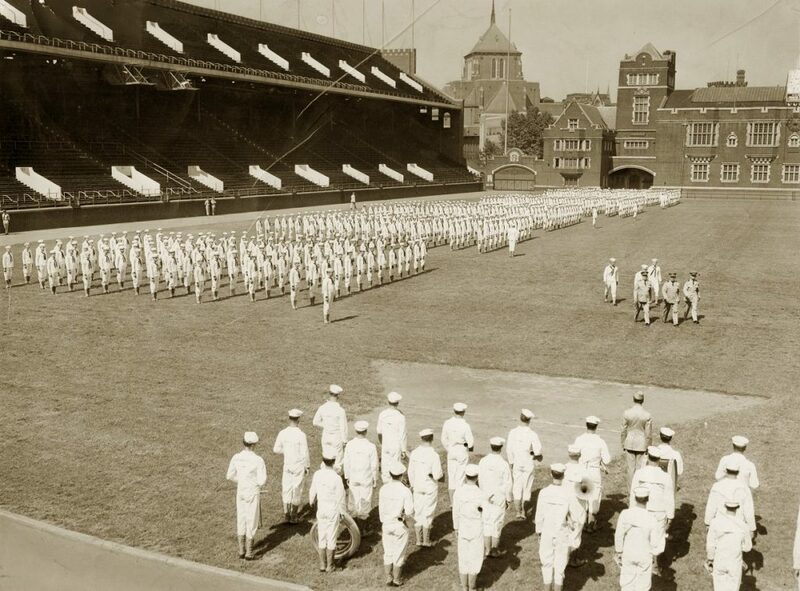 The Naval Training Unit was established at the University of Pennsylvania in the early 1940s as part of the United States mobilization in response to the growing threats of World War II. The first program established at the University was the Naval Reserve Officer Training Corps (NROTC) in 1940. This was followed by the establishment of the V-5 Naval Flight Preparatory School on campus on June 7, 1943. The V-5 program had initially been established by the Naval Reserve Act of 1925 to provide a pipeline for which college students interested in flying could become naval aviators in the Volunteer Naval Reserve. The V-12 Naval Training Unit was established at the University of Pennsylvania July 1, 1943. The V-12 program originated at a May 1943 conference at Columbia University where Vice Admiral Randall Jacobs, Chief of Naval Personnel, called for a joint venture between the Navy and colleges to provide two years of college education at government expense to potential officer candidates who would then attend one of the Navy’s Midshipmen Schools. The program was open to Navy and Naval Reserve enlisted sailors on active duty between the ages of 17 and 23. The commanding officer of Penn’s NROTC program became the commanding officer of the V-12 program which oversaw students in the general line officer program, as well as students in the medical and dental program. Additionally, V-12 commanding officer was responsible for the other V-12 programs in the Fourth Naval District – which include Temple University, Jefferson Medical College, Hahnemann, and the Lutheran Theological Seminary. The V-12 administrative structure included two University officials: the education director who handled all academic matters, and a liaison officer to handle non-academic matters. Matthew W. Black was the Education Director at Penn. Finally, on July, 27 1944 the V-7 Naval Academic Refresher Unit was established at Penn. Prior to May 1944 enlisted personnel who were selected for officer training were sent directly to Midshipmen’s Schools. However it was found that many of these students needed to review college level math, physics, English, and engineering drawing to pass their exams. Penn was one of three V-7 Units (the other two being Rensselaer Polytechnic Institute and Colgate University). Men who reported were given tests in Math, English and Physics; and then placed in either an eight week or a sixteen week courses – pending on their needs. Some were transferred directly to Midshipmen’s Schools. The men were also given six hours of physical drill each week. Edgar B. Cale was the Educational Director of the Unit at Penn. The final days of World War II saw the decommissioning of many of the units at Penn. The V-5 unit was decommissioned in October 1944, and the V-7 program in 1945. The V-12 unit also continued until 1945 when it was integrated back into the NROTC program at the University. The Naval Training Unit Records documents the administrative and academic activities of the V-5, V-7, and V-12 Units at the University of Pennsylvania during World War II. The majority of the correspondence is from either Dr. Matthew W. Black or Dr. Edgar B. Cale. Black served as the education director for the V-12 program, and Cale served as the education director for first the V-5 and later V-7 programs. The V-12 series contains material related to both general and medical students. The Miscellaneous series contains items not directly related to the Naval Training Unit, but came with the collection – including files for Dr. Cale. Photographs related to the Naval Training Unit can be found in the University Photograph Collection (UPX 12), Box 64. Navy V-12 Program (U.S.) . University of Pennsylvania. Naval Flight Preparatory School. Algebra and Trigonometry Classification Test n.d.
Moore School Grades Elective Courses n.d.
Williams, T. J. U. n.d.